Winter in Massachusetts isn’t just sitting on the couch watching the New England Patriots do their b=job. New Englanders like to get outdoors for snow fun, tubing, sledding, skiing and riding, at least between Pats games. The Bay State has small ski mountains and hills ideal for getting your family skiing and riding with Wachusett and Jiminy Peak being the biggest. Call it the ski feeder state of New England, Massachusetts ski areas have learn to ski and ride programs equipped to handle “the masses”, plus ski area daycare, kids seasonal ski and snowboard camps and night skiing too. That is what they do, and they do it well. Wachusett is Massachusetts’ most popular ski resort, with a big ski and snowboard school, over 200 instructors provide lessons day and night, after school and on weekends from the day after Thanksgiving thru March. This family ski resort, with 1,000′ vertical, is all about making it easy for parents – from its easy access, to an immense base lodge with one level convenience. Wachusett’s web site even has tips to make your day on the slopes organized and less stressful. Now Wachusett has a Ski Train from Boston, which the ski area will credit toward the purchase of a lift ticket. Wachusett has kids covered, starting with all-inclusive Polar Kids programs for first timers as young as four. Up the learning curve, Wachusett’s seasonal “Dev” team for ages six and up meets all winter long. For kids whose parents don’t own condos up North, their race and freestyle programs introduce competitions as early as age eight. Wachusett even plans 3-day camps over school vacation weeks. Though its about half the size of northern New England top ski resorts, with 1,000’ vertical drop and three high-speed quads, Wachusett provides a big mountain feel with day trip convenience and cost, plus night skiing to suit everyone’s schedule. Call it the 8-hour vacation. Traveling west, the Berkshires are not just about summer symphony. Come snowfall, Jiminy Peak is a winter snow-sliding playground. 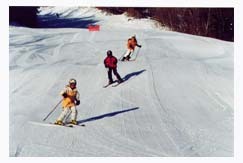 Jiminy Peak Resort village includes a Welcome Center, all-suite Country Inn and state-of-the-art Children’s Center for ski and snowboard lesson programs, Terrain Based learning TLB, and childcare. As Massachusetts’ largest resort, with 1,150’ vertical and a six-passenger lift plus two quads, Jiminy is convenient and complete for families learning to turn. Sister ski resorts Bromley in Vermont and Cranmore in New Hampshire offer similar learn to ski programs and ticket reciprocity on certain passes and programs. 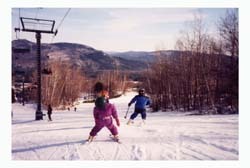 Ski Butternut, also in the Berkshires, is a 1,000’ vertical ski area, with over 40-years of family ski programs. Butternut’s snowsports director for four decades, Einar Aas, must have a deep love of teaching, and a deeper pocket of patience. 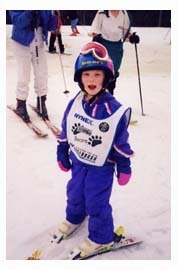 Mountaineers half or full day camp starts kids on skis as early as four, and mini riders starts snowboarders at age 7. With 110 acres of gentle terrain, plus two terrain parks for skier sand riders, Butternut is worth a look. Ski Nashoba Valley in Westford, only 45 minutes from Boston, is open every day and night of the winter season, with extensive learning and race programs. In fact, Nashoba claims to have one of the largest ski and snowboard schools in New England, since 1974, and like the burger chain, “over a million lessons taught.” And with three triple chairs, they keep people moving – up and down, pizza pie to French fries (the ski school mantra). Vert: 240′, Summit 440′, 52 acres, 100% snowmaking, 11 Lifts, 17 Trails, 18 Tubing Lanes. Blue Hills makes the list as a feeder frenzy ski area. With new management this season, and the previous owners involvement with Ragged in NH, this Boston metro ski hill is putting plenty of city kids on snow. Since Blue Hills’ programs are modeled after the success at Ragged, parents can be assured that their kids will receive quality ski and snowboard instruction, whether through a school trip or a family visit. Nicknamed Big Blue (clearly management has a sense of humor too) and located on public land, it provides a veritable public service by introducing skiing and riding to kids who might not otherwise have the chance. Blue Hills is also carving out quite a reputation for terrain park events with the gravity defying generation. Their New England names are cool too – Patriots, Fenway, Tea Party! 30 acres, 14 trails, 1 double chairlift, 3 magic carpets & tubing handle tow, 80% snowmaking, 50 terrain lit at night. Amesbury Sports Park offers the steepest tubing hill in New England, and a new Northern Outdoors white water style snow raft where 8 people experience the thrill of charging down the Kennebec River only on snow.